It has been a week here preparing for Christmas and working. Usually working over the holidays does not bother me too much, but this year seemed extra stressful for some reason and I really did not want to be at the office on Christmas Eve with everyone else on vacation. Better put in for extra time off now for next year! I ran to Whole Foods the day before Christmas Eve after work and it was not fun, way more crowded and chaotic than I remember it in past years and they just rearranged the store so no one could find anything. But the worst was they didn’t have a lot of the items on my list like basic hash brown potatoes and this mythical Follow You Heart’s VeganEgg product I was really hoping to find for hubby. I’ve already put an email reminder on my Google calendar to have all the food planning and shopping done way earlier next year and avoid Whole Foods! Running always helps for dealing with stress and last Sunday I tackled a 6.23 mile run in the chilly wind and rain. 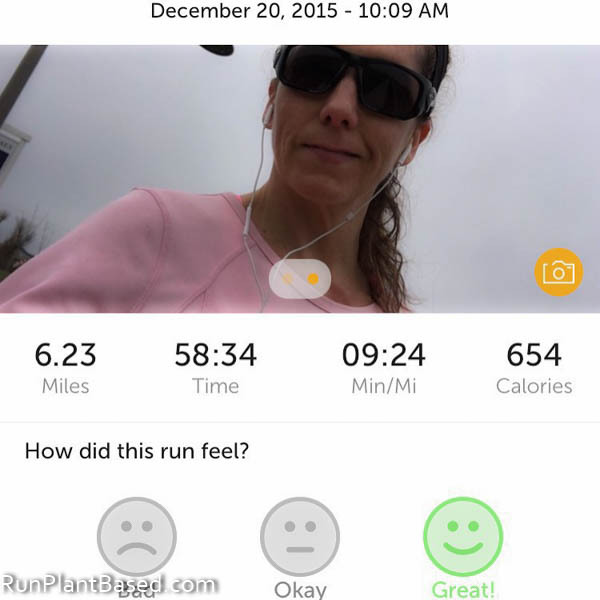 It was slower than usual, but still invigorating to get out and not let the elements stop me. And have been consistent with smoothies this week to help combat the stress and insane amount of germs going around now. 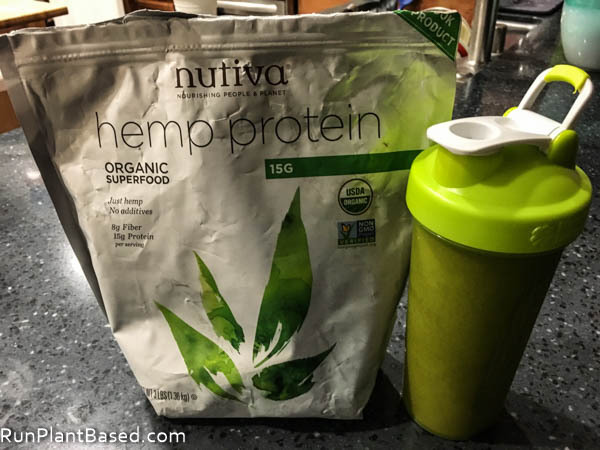 Nutiva’s simple hemp protein may not be the best tasting protein powder for smoothies, but it seems perform well for me with more energy when I use it. The balance of protein and fiber is good for my digestive system and this powder with chia seeds is my favorite pre-race smoothie. And it’s tasty blended with frozen banana and maybe a little stevia or dates for sweetness. 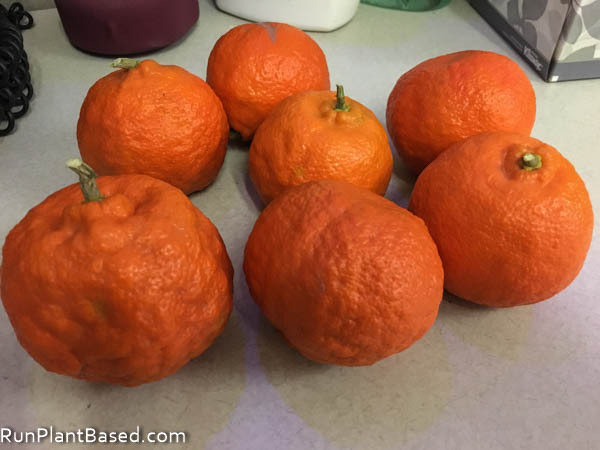 I’ve also been raiding our tangerine tree to keep healthy snacks at work. My boss did something sweet for me for Christmas and I felt bad he went to such the trouble. 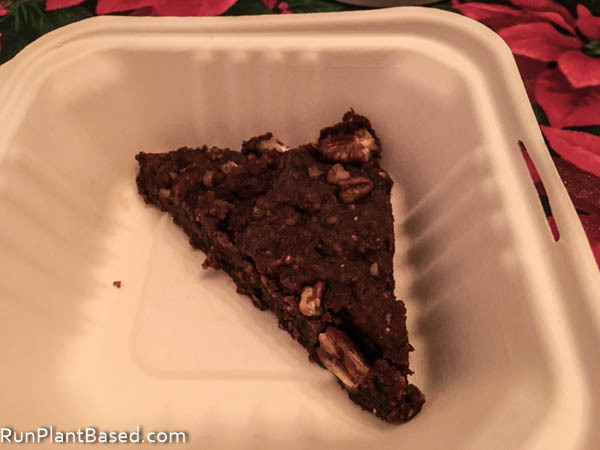 But he got some gourmet local brownies for everyone in our group for Christmas, but a vegan option was not offered (weak!). So he made a trip to Baagan to get vegan brownies for me. 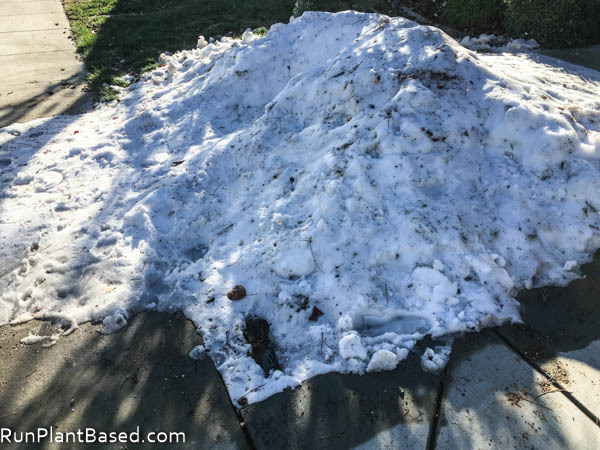 One thing that is nice about where we live in the Tahoe foothills is it rarely snows here and if it does, it’s usually flurries that don’t stick. But snow can be as close as a 20 minute drive further up the hills. We got a huge snow storm the day of Christmas Eve and some really nice neighbor drove truckloads of the snow in on Christmas Eve to shovel into people’s front yards for kids to play in on Christmas morning. 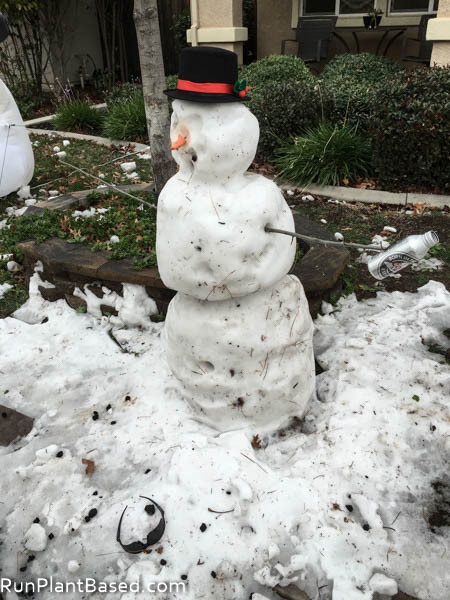 Snowmen were constructed and some even made sledding slides. Most of it is still around since it’s been so cold here, fun! But the chihuahuas want nothing to do with it on walks! 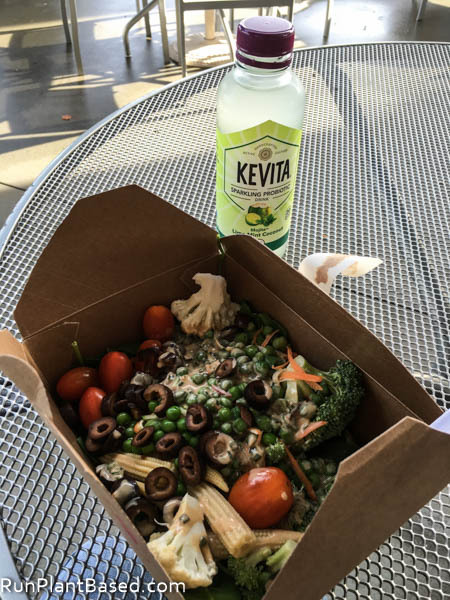 I treated myself to a splurge Whole Foods lunch last week since I was feeling a little strung out with work and planning, always nice. 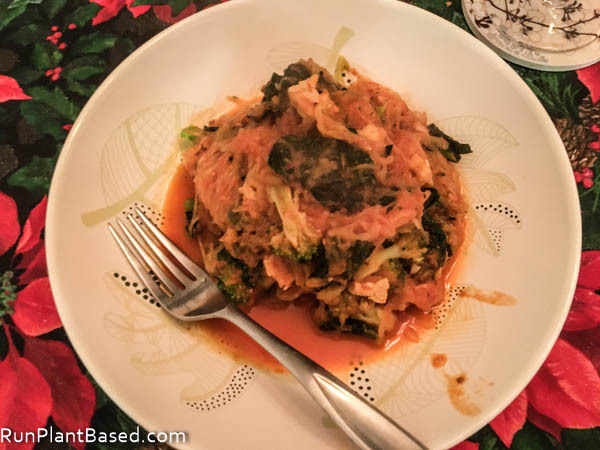 And enjoyed steamed spaghetti squash with marinara sauce, kale, and broccoli for a simple and healthy dinner. 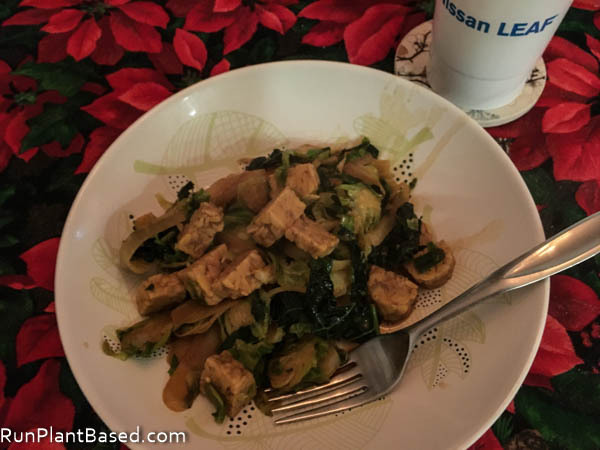 And simple oil free tempeh stir fries, of course! 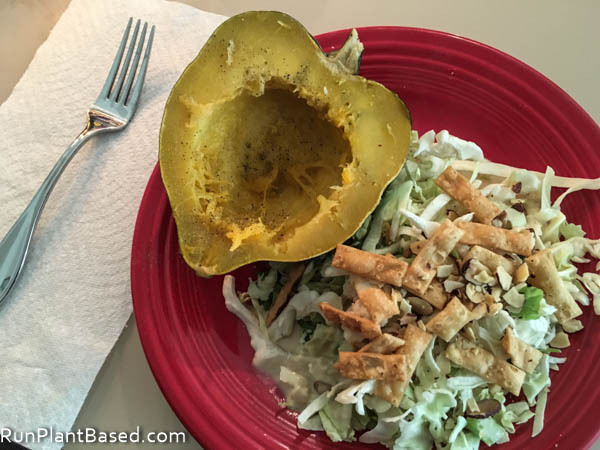 Had this salad and baked acorn squash too, very hearty and filling. 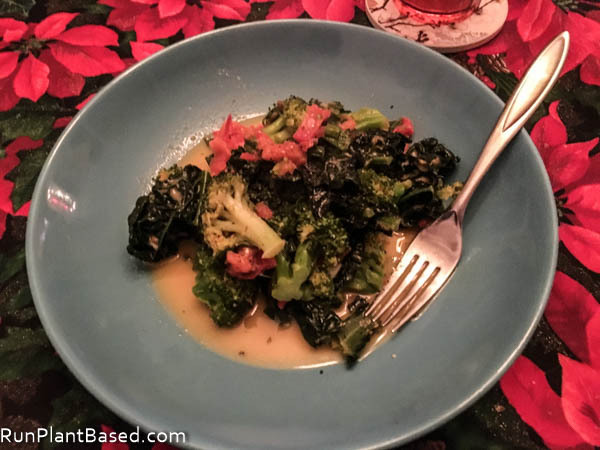 And more simple broccoli and kale sautes. 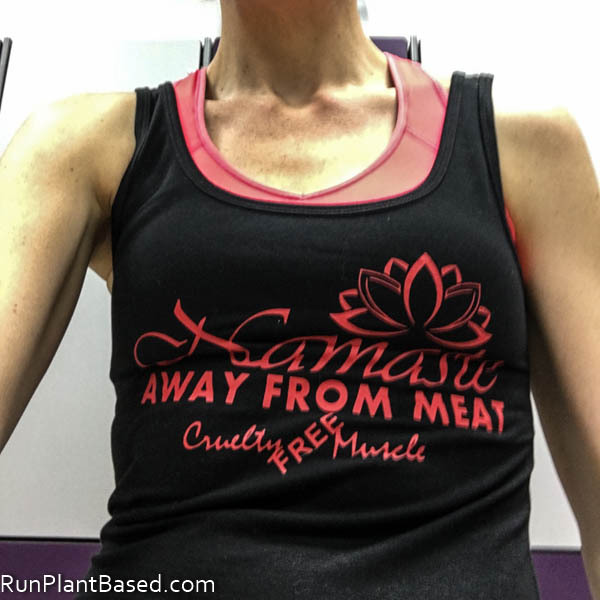 Finally, getting back to the gym yesterday was nice after two days of partying and I got to wear my new Cruelty Free Muscle gym tank from hubby! Remember we had a surprise guest speaker on the Vegan Alaskan Vacation at Sea, the amazing Howard Lyman? I know, it’s going a ways back. But the awesome guys of The Vegan Zombie filmed his entire speech and just posted this wonderful video of it! It’s 19 minutes long and very worth it, he is such an inspiring and entertaining man! And his points on climate change really hit home especially with east coasters getting a heat wave for Christmas and California’a epic drought. His entertaining recount of the Oprah beef lawsuit ordeal is just great too! Scary to think of being attacked by that much money and power, but great! Watch it, it’s worth it! This inspirational couple ditched PCOS and Crohn’s medication on a plant-based diet. This meat and cheese lover found a new passion for health. I don’t agree with this woman’s view on veganism being “insanely” hard. Sure, it’s a big change to take on for a week, but it’s a positive change with the right motivation and passion. Guess I need to try adding banana peels to smoothie now too! Yes and I need to pick up more, so good! I’m just blown away you have a tangerine tree! So amazed. We love clementines here, so tasty. Like dessert. I didn’t know you could pick up food like that at Whole Foods, I’ll have to take a second look! And I agree about the chaos of shopping. I needed pomegranates for the fruit salad. And our grocery store was just madness!!!! I need to finish harvesting the tree, it’s overloaded and I haven’t had time! Whole Foods is supposed to be a wonderland for new vegan foods so I was sad they didn’t have it and didn’t know if and when they’d be getting it. Snow for you but not for us here in Chicago. We had a gray Christmas. Thanks for sharing the Howard Lyman video. Wonderful! But who was the crabby guy in the background-lol? Lol, that was an employee of the ship sitting in on the presentations and they were dressed like lumberjacks because we stopped in Ketchikan that day.